Fall is definitely the time for dark, bold, berry color lips, but as pretty as they look on your pout, those extremely pigmented formula are usually a little tougher on the lips. 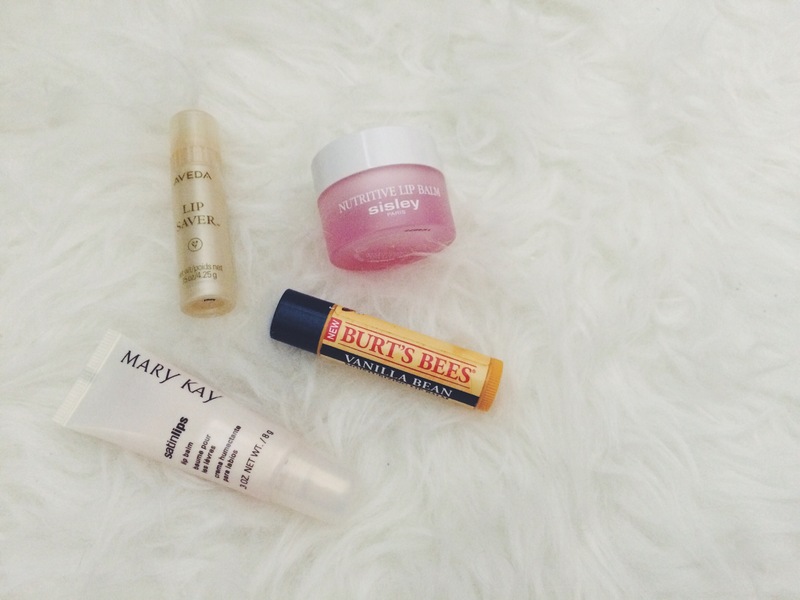 For fall I try to pay extra attention to my lips, keeping chapsticks and lip balms close by. I’m not very picky with my lip balms as long as they have great lasting power and are not sticky. Above are some that are in my current rotation, some were gifts, some were picked up at a grocery store because I was running low. I like them all and find each to be appropriate depending on the time and place. I usually use the Mary Kay Satinlips in the morning to prep my lips or during the day on the weekend when I’m not going anywhere and don’t really need anything super rich, the formula of this one is not as thick and feels kind of like vaseline which is nice and light weight for first thing in the morning. I have the Burt’s Bees Chapstick in my purse, I like it because it’s an easy one to carry around and is very hydrating and creamy so it’s perfect for when I need a little something extra when I’m outside. I keep the Aveda Lip Saver by my bed side and apply before bedtime, it is super rich and creamy and sometimes can be a little heavy, but I think it’s perfect for bed time when I won’t be able to reapply for a while. I’ve mentioned the Sisley Parie Confort Extreme Leveres Lip Balm before, this stuff is seriously amazing and I can’t say enough, but at an extremely high price point I’m trying to stretch it for as long as I can, so I haven’t been using it as frequently, only when I feel my lips absolutely need it.